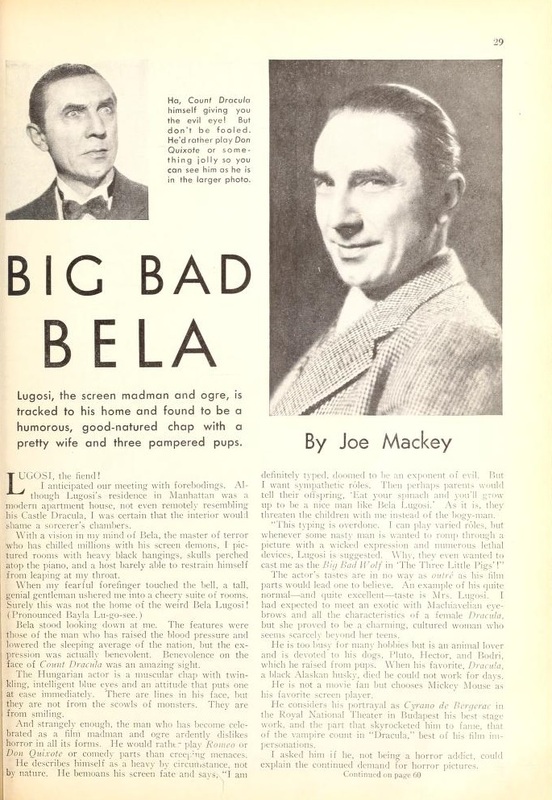 Published in the July, 1934 issue of Picture Play, “Big Bad Bela” followed a by-then established format for interviews with Bela Lugosi. In an obligatory set-up, a shuddering reporter fearfully anticipates coming face-to-face with the living embodiment of the horrific characters the actor had become famous for portraying. When the two actually meet, Lugosi is either portrayed as living up to the reporter’s expectations by relating an allegedly true dark and mysterious episode from his life or, as in the case of Big Bad Bela, as actually being an urbane and charming individual. Writer Joe Mackey spoils his own set-up by revealing that any fears he may have had about Lugosi had already been dispelled when the two met earlier in the year after a performance of Murder at the Vanities in New York. On that occasion the actor proved that he was both “human and humane” by his kindness towards a young disabled fan. Another staple of interviews with Lugosi, and one which would continue for the rest of his life, was the actor lamenting his typing as a “heavy” and the Hollywood system’s reluctance to allow him to demonstrate the versatility he had displayed as an actor in his early career. Although he was occasionally given the opportunity to appear in non-heavy roles, they were inevitably as supporting characters rather than the starring roles which he craved. Perhaps his career would have taken a much more artistically satisfying direction if he had been prepared to turn his back on the starring roles in the horror films he claimed to despise and instead carve out a niche as a character actor. His unwillingness or inability to do this may have stemmed from something more than just his reluctance to relinquish his star status. Lugosi’s financial footing was always precarious. He was forced to file for bankruptcy at the height of his stardom in 1932. His need for ready cash led to him accepting every role which he was offered. Despite this, he continued to live for the day with little or no thought for the future, a philosophy he would come to rue. During a bleak period of unemployment during the late 1930s, Lugosi lost his house and was forced to apply for financial assistance from the Actors’ Fund when his son was born in 1938. That scenario would have been unimaginable in early 1934. At the time of Joe Mackey’s interview, The Black Cat, Universal’s first star pairing of Lugosi with Boris Karloff, was about to be released. The film would be the studio’s biggest box office hit of the year. With Universal already talking about teaming him with Karloff in two further films, The Suicide Club (which was never made) and The Return of Frankenstein (which was filmed as The Bride of Frankenstein without him), the future must have looked very bright for Big Bad Bela Lugosi. Ha, Count Dracula himself giving you the evil eye! But don’t be fooled. He’d rather play Don Quixote or something jolly so you can see him as he is in the larger photo. Lugosi, the screen madman and ogre, is tracked to his home and found to be a humorous, good-natured chap with a pretty wife and three pampered pups. I anticipated our meeting with forebodings. Although Lugosi’s residence in Manhattan was a modern apartment house, not even remotely resembling his Castle Dracula, I was certain that the interior would shame a sorcerer’s chambers. With a vision in my mind of Bela, the master of terror who has chilled millions with his screen demons, I pictured rooms with heavy black hangings, skulls perched atop the piano, and a host barely able to restrain himself from leaping at my throat. Bela stood looking down at me. The features were those of the man who has raised the blood pressure and lowered the sleeping average of the nation, but the expression was actually benevolent. Benevolence on the face of Count Dracula was an amazing sight. The Hungarian actor is a muscular chap with twinkling, intelligent blue eyes and an attitude that puts one at ease immediately. There are lines on his face, but they are not from the scowls of monsters. They are from smiling. And strangely enough, the man who has become celebrated as a film madman and ogre ardently dislikes horror in all its forms. He would rather play Romeo or Don Quixote or comedy parts than creeping menaces. He describes himself as a heavy by circumstance, not by nature. He bemoans his screen fate and says, “I am definitely typed, doomed to be an exponent of evil. But I want sympathetic roles. Then perhaps parents would tell their offspring, “Eat your spinach and you’ll grow up to be a nice man like Bela Lugosi.” As it is, they threaten their children with me instead of the bogy-man. The actor’s tastes are in no way as outré as his film parts would lead one to believe. 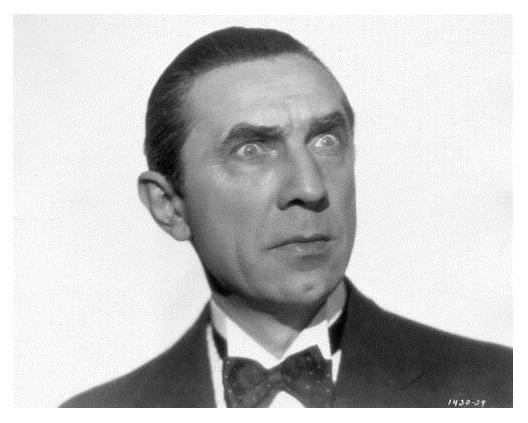 an example of his quite normal – and quite excellent – taste is Mrs. Lugosi. I had expected to meet an exotic with Machiavelian eyebrows and all the characteristics of a female Dracula, but she proved to be a charming. cultured woman who seems scarcely beyond her teens. He is not a movie fan but chooses Mickey Mouse as his favorite screen player. He considers his portrayal as Cyrano de Bergerac in the Royal National Theater in Budapest his best stage work, and the part that skyrocketed him to fame, that of the vampire count in “Dracula,” best of his film impersonations. I asked him if he, not being a horror addict, could explain the continued demand for horror pictures. Lugosi laughed, not the bone-chilling rasp of his movie self, but a pleasant chuckle. 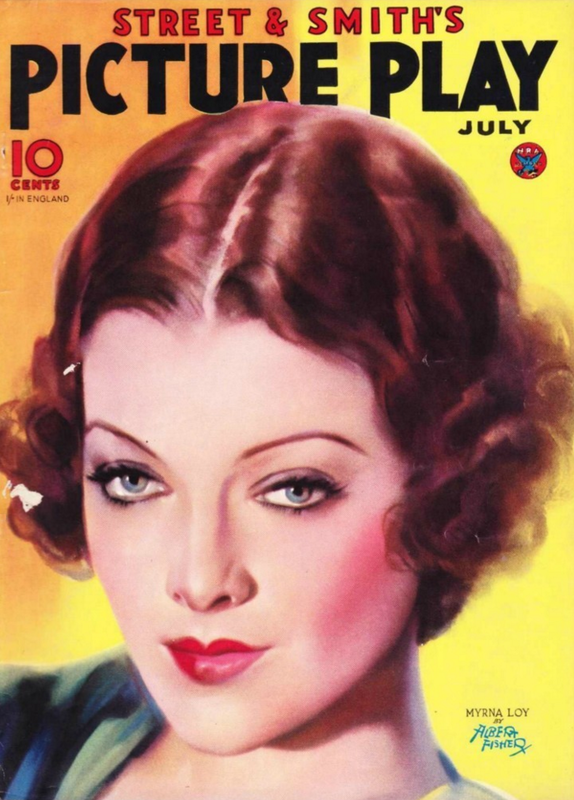 “Although I do not relish having my hair stand on end, the popularity of horror pictures is understandable. The screen is the ideal medium for the presentation of gruesome tales. With settings and camera angles alone, the suspense that s so essential in this type of story can be built up. Bela began his movie career in the pretalkie days of 1923, as the villain in “The Silent Command,” and has been playing increasingly heavy heavies ever since. It was this role that made Boris Karloff his principal rival for the throne of King of Horror. Lugosi, however, considers Karloff primarily a make-up artist, and a man inwardly too gentle and kind to be suited for grisly portrayals. 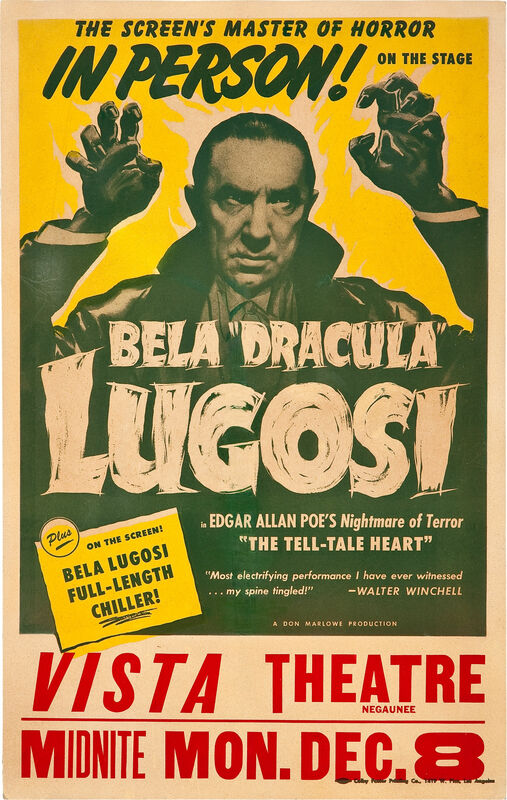 It is an interesting fact that Bela Lugosi was born in Lugos, Hungary, not far from the district where, in bygone centuries, vampires had been horrific realities to the peasants, and more than once a stake had been driven through the heart of a supposed member of the Undead. One of Bela’s ancestors was the first to settle in Lugos which grew into a thriving village and even today retains the family name of its first citizen. In New York when he was starring in “Murder at the Vanities” I visited him unexpectedly. A little incident backstage, which he never dreamed would reach print, revealed the true Lugosi. A youthful paralytic had been waiting to see his idol, Bela, at the stage door. Some one told him after the show and he immediately had the lad carried to his dressing-room. He not only introduced the boy to members of the cast and autographed a photo, but broke a dinner engagement to stay and talk with him. And when the crippled fan left, he told Bela he was no longer just a shadow on celluloid, but a wonderful man. And he meant it. Lugosi! Human and humane to a fault. I had heard of a huge bat ring with ruby eyes that had been presented to him by the “Dracula” cast, and asked to see it. That is typical of the man who wants to forget horror, and the vampires of Transylvania, the zombies of Hati, voodoo doctors, monsters, maniac scientists, and live here as an American citizen. The Silent Command was Lugosi’s first American film, but he began his film career in Hungary in 1917. 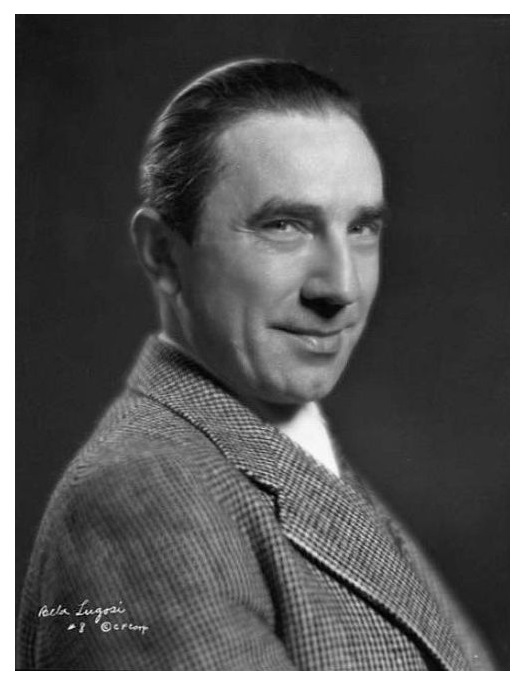 See Bela Lugosi Filmography for a complete list of all of his known films. The Hungarian town of Lugos was not named after one of Bela Lugosi’s ancestors. Born Béla Ferenc Dezső Blaskó, his stage name was derived from that of his home town. The voice of Bela Lugosi features in a new animated anthology of classic Edgar Allan Poe stories. 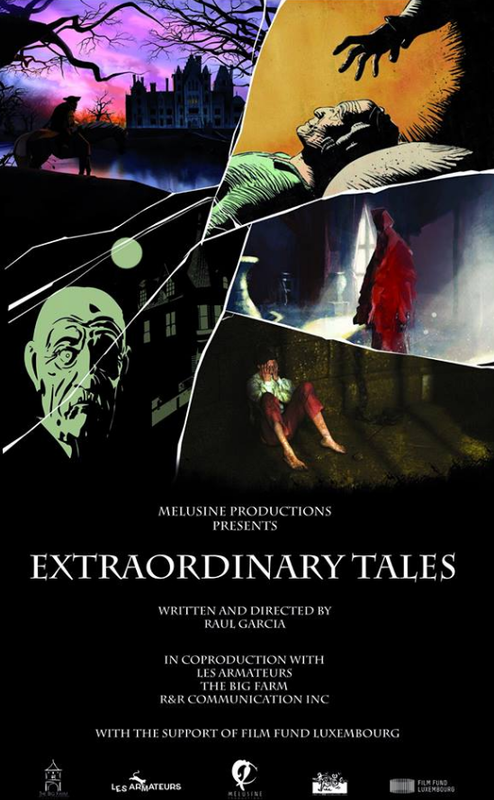 Directed by Raul Garcia, Extraordinary Tales contains versions of The Fall of the House of Usher, The Tell-Tale Heart, The Facts in the Case of M. Valdemar, The Masque of the Red Death, and The Pit and the Pendulum, each animated in a unique style. The 70-minute film features the voices of Bela Lugosi, Christopher Lee, Roger Corman, Guillermo del Toro and Julian Sands. Each of the performances were specially recorded for the film with the exception of Bela Lugosi’s for The Tell-Tale Heart, which was recorded in the late 1940s. 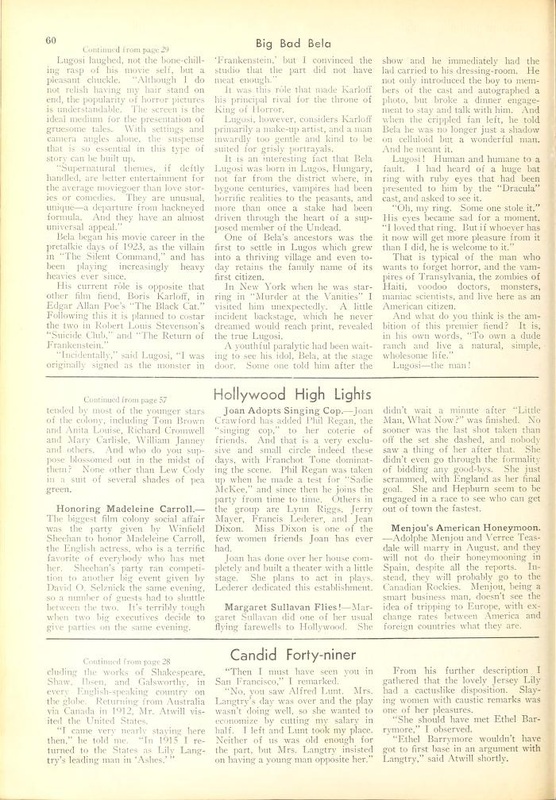 Lugosi, who toured a dramatic reading of the story in 1947, is thought to have recorded the tale for radio syndication. Bela Lugosi starred in four films based on the work of Edgar Allan Poe during his career. The first came in 1932 when he followed up his great success in the 1931 film version of Dracula with Murders in the Rue Morgue. He later co-starred with Boris Karloff in The Black Cat in 1934 and The Raven in 1935. His final film inspired by Poe was The Black Cat in 1941. All four films were produced by Universal Studios. In 1949 he appeared in his final Poe-inspired production, an episode of the Suspense TV series entitled A Cask of Amontillado. Extraordinary Tales will premiere in select theaters and on-demand on October 23rd in the USA.